1981 M.Sc. in Civil Engineering, Mass. Inst. of Technology (M.I.T. ), Cambridge, MA, U.S.A.
1982 Sc.D. in Civil Engineering, Mass. Inst. of Technology (M.I.T. ), Cambridge, MA, U.S.A.
1981-1983 Tutoring for graduate and undergraduate courses in Geotechnical Engineering at M.I.T. 1986-1987 Teaching at the Southeastern preparative College, Athens. (b) Graduate teaching at N.T.U.A. (Geotechnical Earthquake Engineering for the graduate programmes "Structural Design and Analysis of Structures" and "Design and Construction of Underground Works"). (c) Supervision of more than seventy (70) undergraduate and graduate Diploma Theses. 1987-today Geotechnical Division, Department of Civil Engineering, N.T.U.A. 1978-1982 Part-time geotechnical consulting during graduate studies at M.I.T. 1984-1985 Part-time consulting on storm-and earthquake-induced loading of offshore platforms, on behalf of N.G.I. 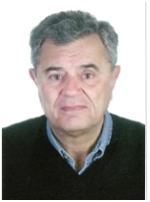 Coordinator of the ETC-12 /ISSMFE international Committee for the evaluation of the geotechnical aspects of the European Seismic Code EC-8 (2003-2006). Director of the Construction Management Division, NTUA (2003-2004). Director of the Geotechnical Division, NTUA. (2000-2001 & 2008-2010). Director of the Foundation Engineering Laboratory, NTUA. (2006-2008 & 2010-). Lecturer in twenty two (22) International and eight (8) National Scientific Conferences. Invited lecturer in thirteen (13) International and three (3) National Scientific Conferences. Invited Lecturer in eight (8) research centers and Universities outside Greece (Japan, Norway, Austria, Portugal, U.S.A. Romania, Albania). Reviewer in six (6) International and one (1) National Scientific Journals. Reviewer in International and National Scientific Conferences. Reviewer of research proposals for the General Secretariat for Research & Technology (GSRT) of Greece. Reviewer of research proposals for the National Science Foundation (NSF) of U.S.A.. Member of four (4) International and five (5) National Scientific Committees. Member of the scientific committee for the Recognition of Foreign Academic Titles (DI.K.A.T.S.A. ), for Civil Engineers (1994-1997).